Over the past several years a new obsession has quietly crept up on me. I find it difficult to walk past a basket without stopping to examine it and, more often than not, buying it and bringing it home. Something to do with the shape, texture and ‘organic’ nature of baskets hold an irresistible attraction for me and despite my determination to keep this house as uncluttered as possible, my collection of ‘woven-ware’ is growing steadily. A window display in Cape Town. Loving baskets as I do, Africa is a good place to live. Baskets abound. There are weavers on street corners, piles of baskets at markets and some beautiful examples in many of our loveliest decor stores. But discovering Amatuli in Kramerville is like walking into Basket Heaven. There are baskets of every size, shape and colour imaginable. 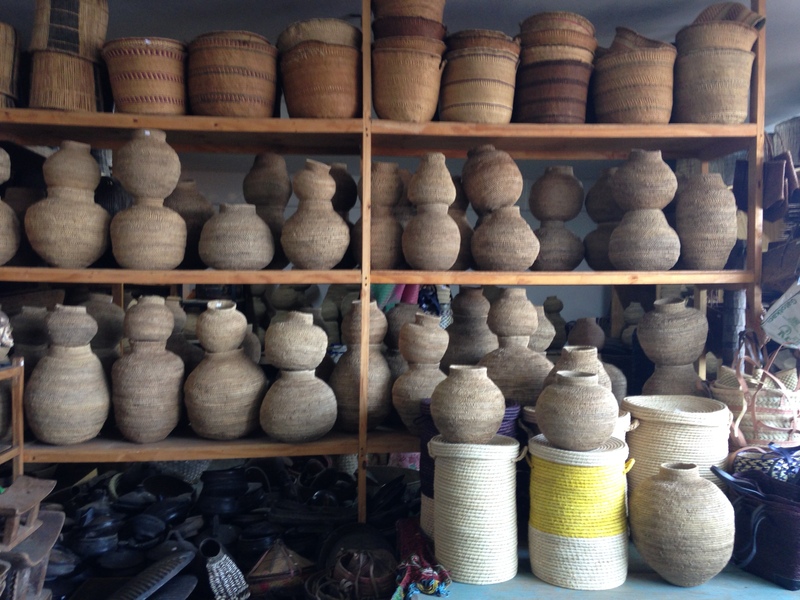 They come from all over the African continent and I am particularly drawn to the Bohero Baskets. These are made from plant fibres by the Bohero people who live on the borders or Zimbabwe and Zambia to our north. They are used for carrying and storing food. No two are alike and there is something very appealing about their form. So far, I have succumbed to three large ones which are under the stairs and a couple of smaller ones which are now on bookshelves. Three shallow (originally brown) African baskets, now painted in duck egg, hang above the headboard. Art Africa in Parkview is another source of beautiful basket-ware, along with a huge variety of other African craft work. The brightly coloured baskets on the wall come from there. They are made with telephone wire, rather than grasses or reeds. Art Africa. Just love these black and white wire baskets. In most South African towns it is not unusual to find street vendors selling basket-ware on pavements, street corners, traffic intersections and, of course, markets. I have only to go a couple of blocks to find Khosi who comes from Swaziland. She makes beautiful baskets and floor runners and can be found most days of the month on a corner of 4th Avenue in Parkhurst. The woven grass runner in the kitchen area of the guest suite was made by Khosi.